Whether you’re dealing with the real thing or a good impersonator, there is no doubt that marble is one of the most popular products for bathrooms and kitchens. Why? 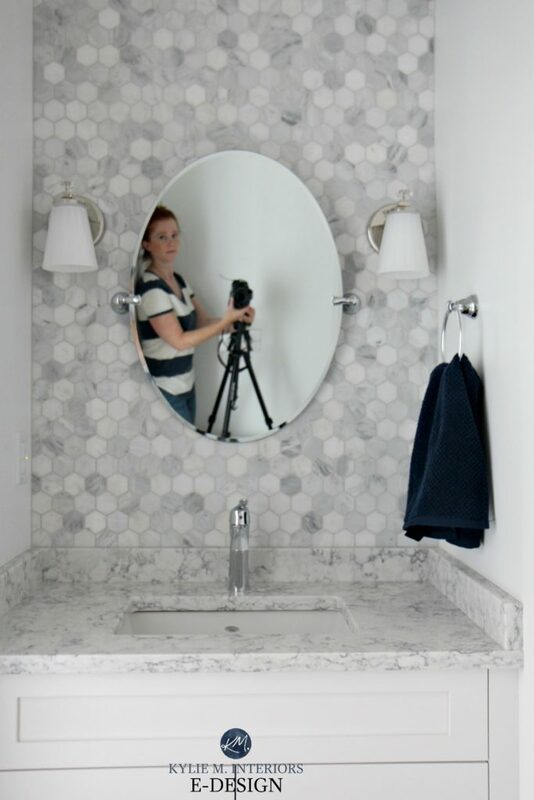 Well, although the maintenance issues and cost leave a lot to be desired (for this bbudget-friendlygal anyway), the look of marble is a timeless classic that undoubtedly adds style and value to a home. BTW – in an effort to have only my E-design clients photos on my blog, this post has minimal photos, but the info is still ROCK solid and I’ve included the links to some good Pinterest shots for you! Today’s most popular marble tiles and countertops are usually a mix of white, gray and black. HOWEVER, if you’ve been hangin’ with me for a while, you’ll know that most grays have a subtle (or not so subtle) undertone – and marble is NO exception. The undertones most commonly found in marble are blue, purple, a taupe based greige and sometimes a weeee smidge of green. Once you figure out what type of gray is in your marble, you can then look at paint colours that will coordinate – rather than clash. I’ve found that there are a few dozen colours that seem to work well with most marbles, and while there are many other things to consider (backsplash / LRV / exposure/flooring / personal tastes), these colours should at least get you headed in the right direction. Sidewalk Gray is a very ‘pretty’ gray that has a cool purple undertone (leaning slightly to the blue side rather than the red side). It is subtle, but not so subtle that your walls will look ‘gray’ – as that whisper of colour will come through. The LRV of Sidewalk Gray is 61, meaning it will bring some life to a room, but certainly won’t be overly bright or glaring. Sea Salt is a super popular colour for ANY room (not just for marble!). You’ll find that Sea Salt is a lovely soft green with a gray background to calm it down. It’s also been know to flash a bit of a blueish look – without committing to it enough to stretch out of the green zone entirely. The LRV of Sea Salt is 64, so it will be slightly brighter looking than Sidewalk Gray. 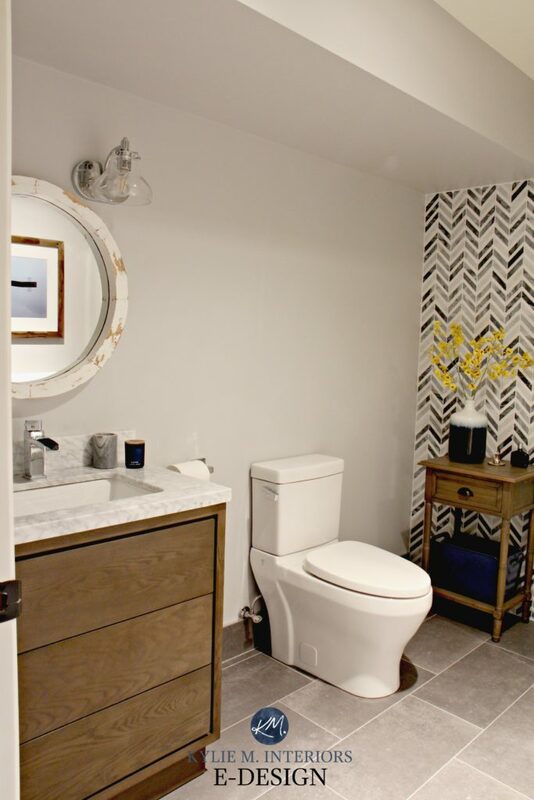 While it’s not shown with marble in this bathroom, from the overall style you can see how Sea Salt is a great paint colour for this type of look. Being the darker version of Sidewalk Gray, it only makes sense that this is also a stunning paint colour with marble! Pigeon Gray is a gorgeous gray with a decent cool purple undertone. Cool purple is basically a purple leaning toward the blue side. The LRV of Pigeon Gray is 42, so it will be a bit darker looking than the other colours on this page, but it’s not so dark that it will weigh a room down or add TOO much contrast with marble. This gray is totally underappreciated. Maybe it’s because of its placement in the fan deck or maybe it’s ugly and I’m just crazy, but I find that Stonington Gray is stunning when placed with a cool gray toned marble. The LRV of Stonington Gray is 59, so it will add some light and life to a room. Click on above image to see available packages! Gray Owl is probably the most subtle on this page with its undertones of green and blue. You’ll find this colour ‘usually’ looks gray, but can flash a touch of green/blue in the right conditions. If you have a marble that is a bit more greige or warm vs the more traditional COOL gray marble, then you might LOVE Worldly Gray. This is a greige with a whole mix of undertones that are super accommodating and don’t actually commit to looking anything but ‘greige’. There is NOTHING wrong with going white – which can keep things bright and fresh if your marble is a bit busier! Shown above is SW High Reflective White with a wicked cool marble hexagon and beautiful quartz countertops. Pure White is still white, but a softer approach. 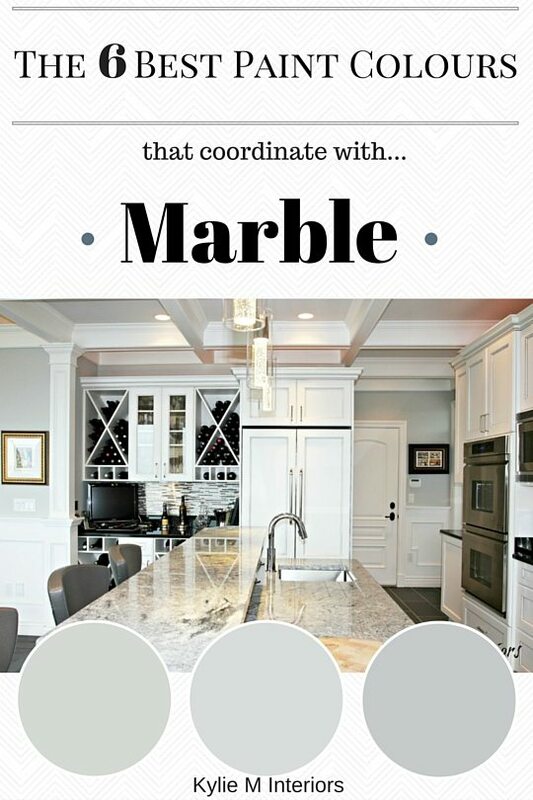 Not sure which colour is best for you, your marble, and the specific features of your home? Check out my affordable Online Color Consulting/E-Decorating Services – I’d be happy to help! I left a comment earlier, but it disappeared. In brief, I said in my comment that I tried Gray Owl on white paper and it looks like a pale pale green, very hard to see it as a gray color or with the blue undertone. I did a color match with sherwin williams paint and I wonder if it was a bad color match. Do you think color matches work all the time? I didn’t have a paper swatch to compare the sample to the BM color. Bad color match. Gray Owl is pretty neutral. I LOVE your site! I have learned so much! I go on Benjamin moore’s site and compare colors online. I chose for my living room which is dark and a cool room (light brown on dark brown) (NOT my choice) I went with Gray Owl and Rockport and wow opened it up and feels not only brighter but warmer too with the subtle undertones. I actually love all of these. I used Stonington Gray in a boy’s room with lots of navy blue, white and a touch of deep red, and it was absolutely perfect. I think it would work excellently with marble, but haven’t had a chance to try that yet. Hi Kylie! Great article! I’ve decided to paint my kitchen and living room with Owl Gray but I’m having a hard time trying to decide on a good white trim color for Owl Gray. What are your suggestions? Thanks! Hi April, thank you for the note! When it comes to the cool grays like Gray Owl, I’m inclined to keep things crisp and simple with a white like Super White – simple and fresh with no sneaky undertones to contend with. 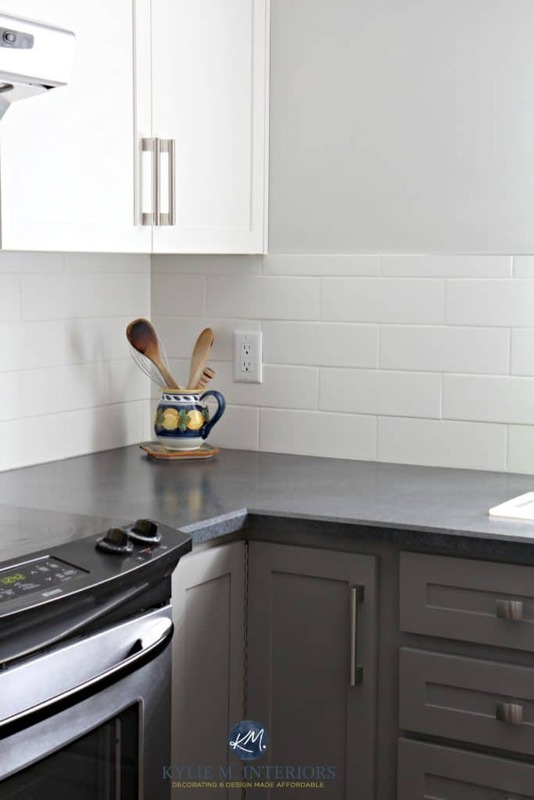 I recently remodeled my kitchen and freshened up the walls with BM Owl Grey. I used BM Simply White oc-117 for the trim and it look beautiful. Simply White is a great choice especially if you have an abundance of honey maple ???? going on. We just put in Gunstock Oak hardwood floors and now we need to paint. We were thinking a cream color with white base boards. Out fireplace is a marble ceramic tile, so I was thinking of doing a dark gray accent wall. Will that look weird with cream colored walls and white trim? Hi Kelly, it won’t look weird at all! I have relatively ‘gunstock oak’ coloured floors with cream walls and have several more striking feature walls! I’d be interested in what your choices of cream would be to with Carrara marble, and look alikes. I get how all the grays go and anything with a gray undertone. But what if the direction you need is a cream? Hope this makes sense. Thank you for this post. We just remodeled our bathroom using Statuario Marble for the shower and counter tops. We used Dunn Edwards Swiss Coffee for the cabinet color because the crown moldings were already that color. Not sure I am happy with the color of the cabinets as they do not look pure white with the marble. I will paint the walls gray. What do you think of using Stonington Gray to offset the yellow of the swiss coffee color? Or should I have my cabinets repainted? I’m redoing my masterbath and having a hard time finding a paint color to go with my cabinets and countertop. The cabinets are off-white (more on the ivory side) and the counter top is Diana Reale Marble. The mirrors have a wood frame the same color as the cabinets. I was looking at Benjamin Moore White Sand 964, Bar Harbor Beige 1032, or Frappe AF-85. I’m going for a classic look, but also a beachy light and airy look. The floors are a light tile that looks like hard wood flooring. They have an ash tone to them similar to driftwood, but with a more beige undertone. What a joy to find your posts on all these beautiful cool grays. Thank you, Kylie, for all the educational information. I bought 8 different sample colors from your various posts on grays but I love Sidewalk Gray! I had it custom to take out 1/2 of the violet and replaced with 1/2 blue., a soft light bluish/lavender. It’s so beautiful and add a modern look to my white cabinets & marble top . I am thinking of adding an accent wall. Do you have any suggestions for a complementary color (s)? What paint colors would work on cabinets and walls in a kitchen with dark emperador marble? I have white carrara countertops and BM white dove cabinets. I was looking at SW anonymous or a lighter shade of gray for my island. What do you suggest? 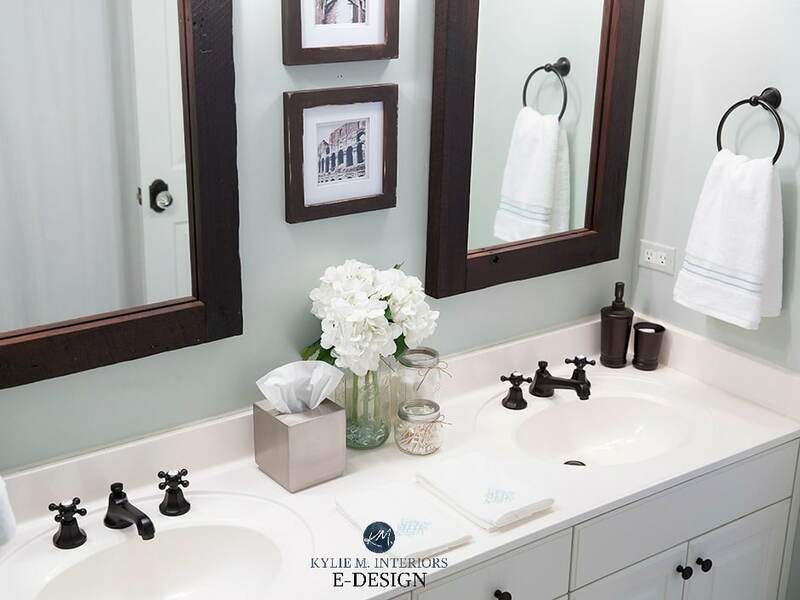 Kylie, I need help with white paint colors for cabinets in my bathroom and kitchen. 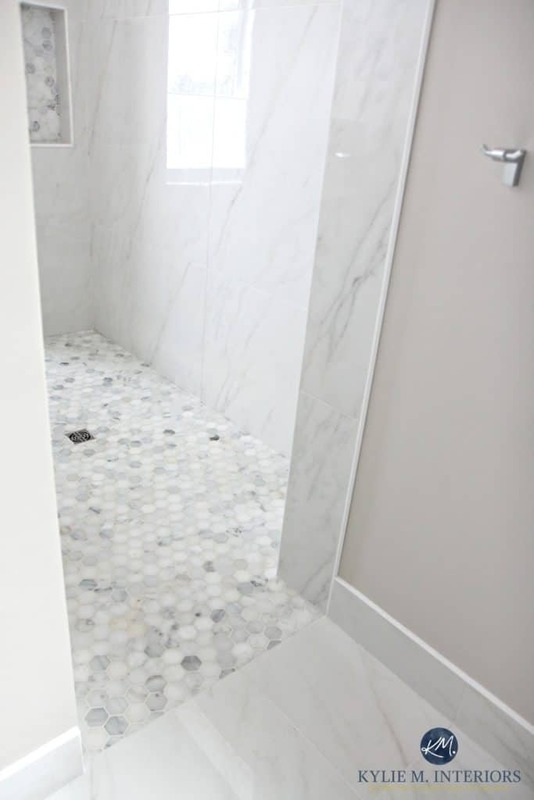 Bathroom has Rainwashed walls and Carrara marble countertops and shower. Western exposure. Kitchen/great room has BM’s Pale Oak walls (pale greige) and White Nile quartzite countertops which are described as having a mix of warm and cool colors. Northern exposure. Considering Pure White (or Extra White )for pop against Pale Oak walls …. maybe Sterling White for Carrara in bathroom. ??? Suggestions? Will agreeable gray work with a marble floor? White with gray veining that is shiny.